Question: What happens when you find yourself tossed in the middle of a huge group of people that have nothing in common with you (besides maybe the fact that they’re bipedal) yet EVERYTHING in common with each other, thus making you as out of place as possible? Answer: You find yourself one step closer to home! 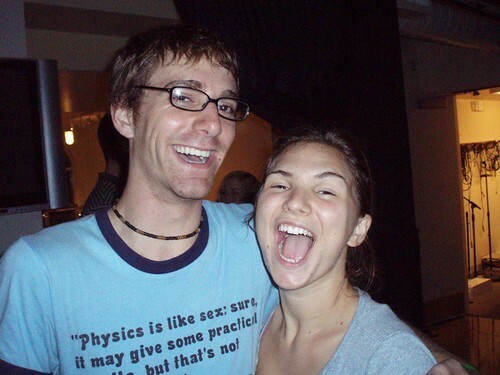 is an awesome guy…unfortunately, he’s also just as skinny and dorky as I am. Not to mention, for the first time on this trip I actually felt overdressed. 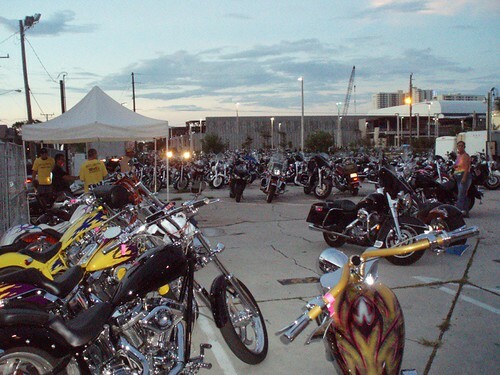 So, to say we stuck out like a pair of sore thumbs at Biketoberfest would be an understatement. Luckily, that’s exactly what made the day interesting. 1. 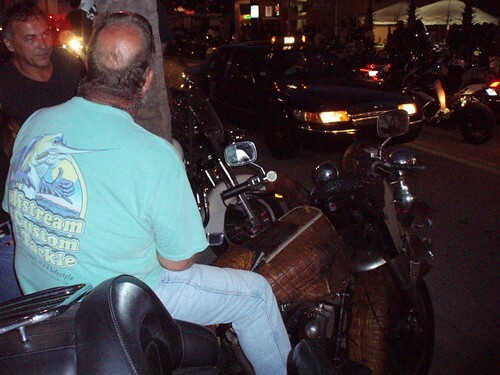 Motorcycle rallies are not a place to find “attractive” women. 2. Fat men in leather will not hesitate to use their girth to move you. 1. The sheer number of motorcycles and bikers was amazing and the pictures don’t do the numbers justice. You’ll have to wait for the podcast later in the week to be truly amazed. 2. A dude with a motorcycle that was COVERED in alligator hide…from a gator HE killed less than twenty miles from Daytona Beach. 3. 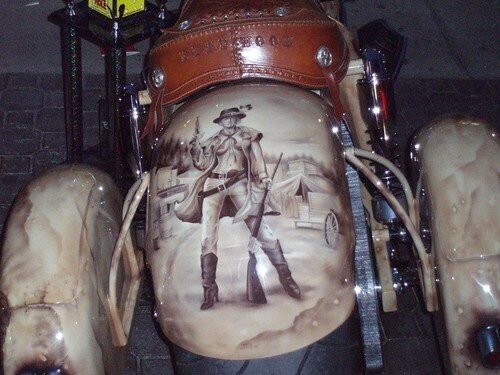 Another motorcycle with incredible artwork that reminded me of a western comic book. That’ll have to be all for now. But #39 is officially done! The podcast should be up later this week. I intended to put a surprise podcast up tonight but I figured it was important to let you guys know another objective had bitten the dust! The surprise still stands though and I’ll probably post it tomorrow! Exciting? Thought so. If you liked this story, why not buy me a leather jacket, so I can fit in? 1) what does your host’s shirt say? it looks funny! 2) is mr. alligator hide’s TIRE coated in alligator hide, or is that just me? if so, that seems unsafe somehow…. Question: Which kind of bear is best? False. Sidenote – sleepyrobin was awake at 545 in the morning, which either makes her A) a party animal or B) a party animal who works way too early. I think people in assless chaps should find more reasons to travel in herds…but uh, bathe…also. Okay, three answers…Erin, I promise that video will see the light of day somehow and soon. But…this surprise is going to be a little different.